To convert one data type to another, CAST and CONVERT functions can be used. From the syntax, it is clear that CONVERT() function has an optional style parameter, where as CAST() function lacks this capability. The following 2 queries convert, DateOfBirth's DateTime datatype to NVARCHAR. The first query uses the CAST() function, and the second one uses CONVERT() function. The output is exactly the same for both the queries as shown below. Now, let's use the style parameter of the CONVERT() function, to format the Date as we would like it. 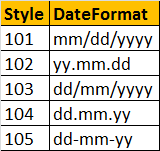 In the query below, we are using 103 as the argument for style parameter, which formats the date as dd/mm/yyyy. For complete list of all the Date and Time Styles, please check MSDN. Note: To control the formatting of the Date part, DateTime has to be converted to NVARCHAR using the styles provided. When converting to DATE data type, the CONVERT() function will ignore the style parameter. Now let's look at a practical example of using CAST function. Consider the registrations table below. The following are the differences between the 2 functions. 1. Cast is based on ANSI standard and Convert is specific to SQL Server. So, if portability is a concern and if you want to use the script with other database applications, use Cast(). 2. Convert provides more flexibility than Cast. For example, it's possible to control how you want DateTime datatypes to be converted using styles with convert function. The general guideline is to use CAST(), unless you want to take advantage of the style functionality in CONVERT(). Write a query which returns the total number of registrations by Year? Can anyone advise how to show my graph in chronological by month.